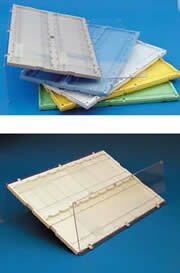 Acrylic slide rack, inclined, used for draining/drying slides. 10 slots accommodate 50 slides. 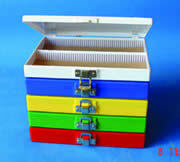 Made from solid high density polypropylene blocks with 13 slanted channels (on a 10o angle), 1/16"(1.5mm) (W) x ⅜" (9mm) (D). 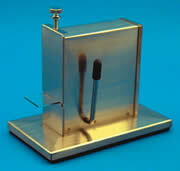 It is made to hold 3x1" (75x25mm) slides during cleaning, draining excess immersion oil, and even drying. They are white in color and are chemically resistant. 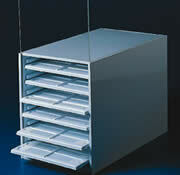 Available in 40 or 90 capacity (vertically held). Molded from blue high-impact styrene, the Carolina blue Box is manufactured to our exacting specifications. 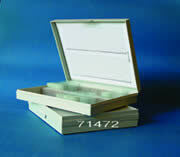 Compared to conventional wooden boxes, the Carolina Blue Box is smaller in size, lighter in weight, and held to closer dimensional tolerances. 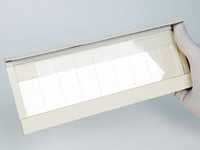 The 75 x 25 mm (3 x 1") slides fit the slots and will not slip out once in place. 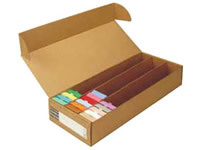 A shoulder on each box excludes dust and identities the top of the box. 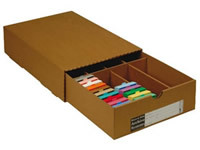 The boxes are available in two sizes: 3¼" x 4¼" x 1-3/16" (for 12 slides). 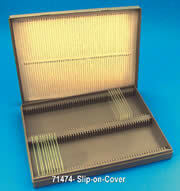 Same characteristics as (#71470), but with a slip-on cover; Holds 25 1 x 3" slides. ¼"(H) x 3½"(W) x 5½"(L). Made from wood with numbered partitions which correspond to the index card. Very durable and has a detachable lid. 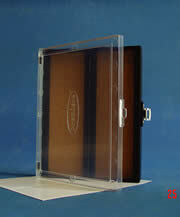 The box accommodates 25 of 3 x 2" slides. 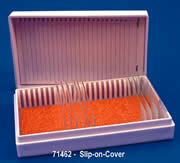 This reinforced ABS material is rugged and designed not only for storage but transport of slides as well. 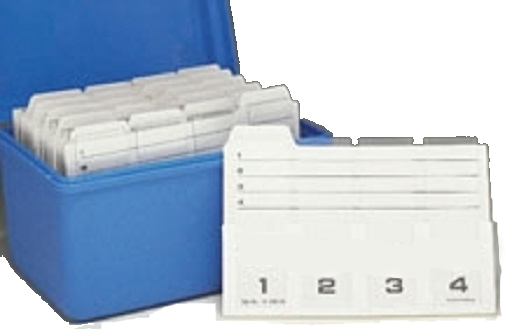 Holds 20 or 30 of 1 x 3" slides in a numbered compartment. 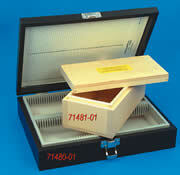 The compartments are recessed so the specimen cannot be touched when the cover is closed. Measurements: 8"(W) x 13½"(L) x 11/32"(H). Measures: 7½" x 13½" (17 x 34cm). 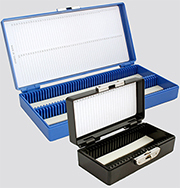 The outside is made of white polypropylene, the tray rails are polystyrene, and the vertical sliding door is clear acrylic; this 240-slide capacity cabinet holds twelve microscope slide trays (#71500) horizontally, and it is dust free. Measurements: 7¾" x 14" x 7½" high (17 x 36 x 16cm). 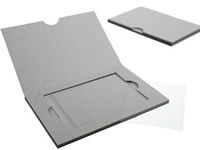 The Slide Folder™ will hold up to twenty standard microscope slides 75 x 25mm (3 x 1") and is made of two parts: a base holding the slides horizontally offering numbered space for easy identification, and transparent doors which can either cover the slides or be swung behind the SlideFolder™ for space conservation while using the tray. 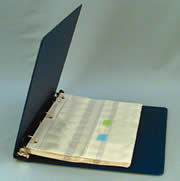 The base is available in 5 different colors, offering color-coding for each job. 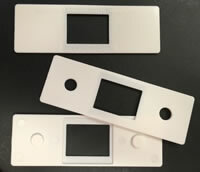 Each slide location is identified with a number from 1 to 20. Removal of the slides is made easy by simply pressing on one end, which will lift the other end up. 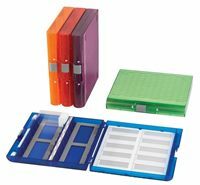 The two transparent hinged covers offer a full view of each stored slide, even bar codes can be read without removing of the slide. 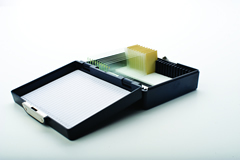 All units are stackable and will resist temperatures between -80°C and +100°C. They are not autoclavable.